When the item of clothing went on sale as part of the Gap X GQ limited-edition collection on September 27, a Change.org petition quickly amassed almost 5,000 supporters. Indian Country Today reprinted a letter sent to Gap by one of its customers, which read: ‘It is with great sadness that I notify you I will not be shopping at your store until you remove the Manifest Destiny T-shirts available at your stores. While another angry shopper wrote: ‘Let me get this straight? 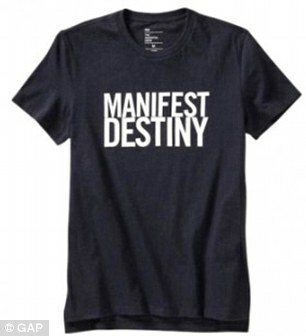 The Gap wants to sell T-shirts that read; Manifest Destiny? Gap has now removed the black and white tee from stores and its website. A link to the product on its website currently displays a ‘product not found’ error. The limited edition T-shirt was created in a collaboration with GQ magazine and designed by U.S. fashion designer Mark McNairy. As shoppers made their distaste towards his design known, Mr McNairy caused further outrage by Tweeting: ‘Manifest Destiny. Survival of the fittest’. However the Tweet has since been deleted from his Twitter account, and yesterday he explained why he chose to use the ‘racist’ motto. He Tweeted: ‘I first learned of Manifest Destiny in American history in junior high school. ‘To me it has always meant that one could set goals, work hard, and achieve their dreams. ‘Having the opportunity to design for the Gap was the realization of one of my dreams. The designer is known for using offensive slogans. His menswear collection, New Amsterdam, includes shirts printed with the words Be Nasty, F*** Ivy and Iowa Bumf***. Gap confirmed that it will no longer be selling the item of clothing, and said in a statement: ‘Thank you for your feedback regarding the Manifest Destiny t-shirt. LOS ANGELES, CA, October 16, 2012 – American Indian Movement Southern California (AIM So Cal) Chapter is left furious and demanding more, after Gap insufficiently responds to outrage to a MANIFEST DESTINY t-shirt by designer Mark McNairy. Posted on October 18, 2012, in Decolonization and tagged aim, aim socal, aim southern california, American Indian Movement, anti-colonial resistance, colonialism, colonization, Gap, Gap manifest destiny, Gap t-shirt, Indigenous resistance, native resistance. Bookmark the permalink. 1 Comment.